US citizens and Green Card holders who would like to give to IBCB and would like or require an IRS approved tax certificate, can do so through The International Baptist Ministries (IBCM) which is a charitable organization in the United States registered with the IRS. The IBCM will then issue a tax certificate following the year end. The tax certificate is issued annually to the taxpayer following the year end. Please visit International Baptist Church Ministries to make your donation on-line. 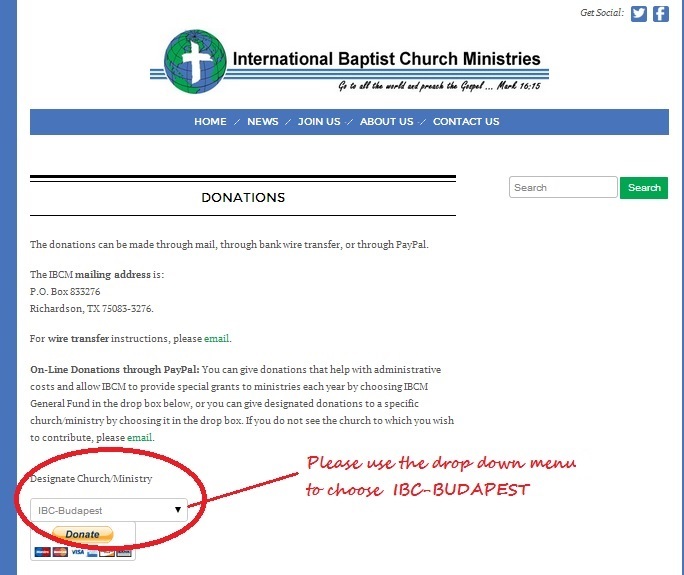 Please be sure to use the "Designate Church Ministry" button to select “IBC -Budapest” as the place for your offering as shown in the illustration below.